India and its style in each and every thing whether it be traditions, culture, different weddings, foods and different flavors in food and etc always be the most demanding one and the one which attracts foreign people towards it. So, here is about only “India Tadka” cakes by the term we mean that the cakes in which you will see the Indian flavor, work or other things which will relate the cake to India. So here is the variety of cake by CakenGifts for Indian people and for the people who loves India and its style every much. You can gift these cakes to any one for occasions like Diwali, raksh bandhan and other Indian festivals at your loved ones doorstep the delivery of luscious Indian style online cake in Ghaziabad. Gift your elder sister a luscious online cake on her weeding. The cake is decorated in Indian style and has some designs reflecting to the old traditional embroidery which is mostly found on Indian clothes. Gift her and her husband a luscious cake delivery in Gurgaon on the occasion of their weeding. If you like eating egg-less cake then you can order online egg-less cake from the website of Cakengifts.in as they have huge variety in online cakes and also offers their customers many different types of cakes like egg-less, egg-based, designer, round shape and etc and different flavors, designs and many more things. If you want to check more you can open the site www.cakengifts.in for your kind consideration upon cakes. Delicious and eye catching Indian Embroidered Multi-tier Cake in red color and red velvet flavor will be best for the Lohri celebaretion or Diwali. It truly reflects the real work of India. You can order the cake in your choice of flavor and design. If you want the cake in one level you can order that too. 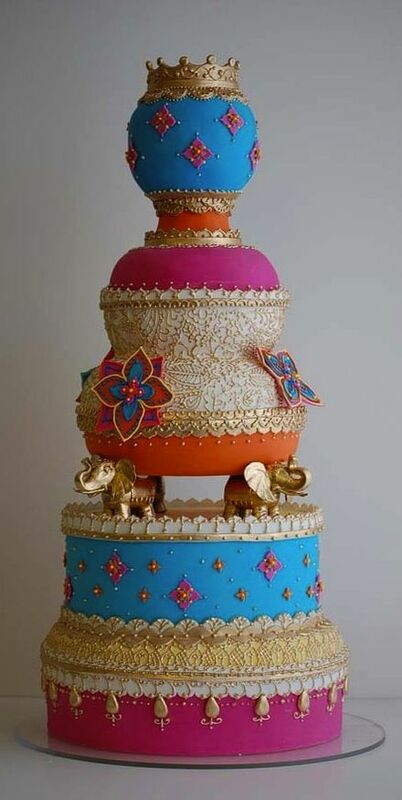 Multi-tier Cake with Jaipur theme of India and bright colors of levels of the cake are just perfect for traditional but yet modern wedding in Jaipur or Rajasthan. And your guests will be going to appreciate you for this arrangement. The cake is beautifully embroidered with golden edible old kinglike decoration which is making the cake kingly. A typical Indian wedding cake on Indian weeding theme. You can gift this cake to your mom and dad on their 25th wedding anniversary or can gift to your closed one on his or her wedding day to be celebrated with this luscious as well as eye catching cake. 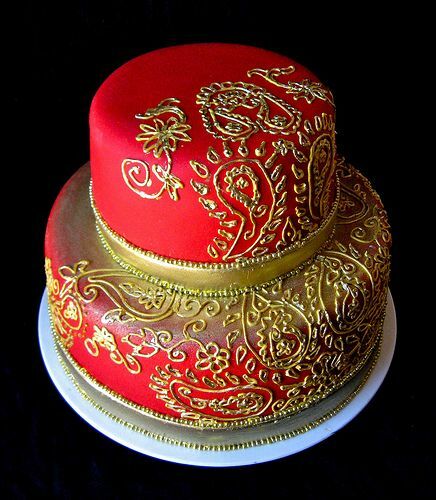 The cake has beautiful golden and red color combination all over and the golden lace design on the cake making it look more beautiful. And the most enjoyable part of it is that a pair of Indian bride and groom in their traditional dresses is placed on top. You can enjoy more events with many more interesting themes of Indian Cakes or can also gift to your relative and friends on their special occasions. Celebrate the Earth Day with environmental friendly things to save your Home Planet Earth.